Which Battle Did They Die In? As Remembrance Day is coming up, I thought I would make a theme of it for the upcoming weeks. This week, I will try to answer a question that most people may ask, when talking about a relative who died during the World War 1; 'Which battle did they die in?' . You could look into newspaper articles but not everybody is mentioned in there. This is not actually an easy question to answer as when searching for a military death, you won't get an answer as to where the person was killed. So you have to work around it and put the pieces together. However, you will get a date, what regiment they where in, what battalion and other information about them. The three mentioned bits of information is what you will need. As an example, I am using a relative called James Doble, who died during the war. He was born in 1894 in Upottery, Devon to James and Margaret Doble (Margaret née Mitchell). From his search on the CWGC site, I can see that he was a 'Private' with the service number '45675' (It says 35675, but I know that to be wrong) along with the cemetery he is buried in, Abbeville. But the important pieces of the puzzle are, as mentioned above his death date, 5 May 1917, his regiment, the Devonshire Regiment and his battalion, the 8th Battalion. In 1917 They fought during The German retreat to the Hindenburg Line and the flanking operations round Bullecourt during The Arras Offensive, before moving to Flanders for the Third Battle of Ypres, seeing action in The Battle of Polygon Wood, The Battle of Broodseinde, The Battle of Poelcapelle and The Second Battle of Passchendaele. In late 1917 the 7th Division was selected to move to Italy. They took up position in the line along the River Piave. I'm then going to see when these battles took place. Now, looking at these battles I can see the 5 May was during The Arras Offensive and was part of the flanking as mentioned in the above quote. However, this may not always be correct. If your relative died of injuries it may not be the same day as the battle took place and sometimes dates don't always add up properly! 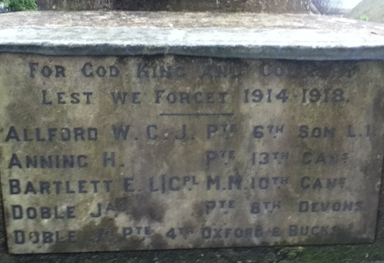 James is remembered on the war memorial in Upottery, along with his cousin John Doble, among others. This is just one portion of it. Also, I'm also going to link in a previous article about how you can commemorate your relatives: Remembering The Fallen.